Did you know that 26 percent of South Dakota farmers are women? The stereotypical farmer is an older male. But according to the USDA, there are more than 12,100 women farmers in South Dakota, farming nearly 14 million acres for a $197.1 million economic impact! Some women farm or ranch on their own. Others are part of family operations. Here’s what might surprise you about women farmers. Women farmers handle a wide variety of farm work—anything from planting and harvesting to delivering baby animals and fixing fences. Along with tending cattle, operating all the farm equipment (like tractors, planters, combines, grain carts and semis), helping with machining and doing seasonal chores, Wendi does the books for the farm. Wendi also manages the home, which includes laundry, cooking, cleaning and lawn mowing. Together with her husband, she cares for their two children—with another on the way in a few weeks! But that’s just a small portion of Barb’s responsibilities. She also cares for her six grandchildren while their parents are at work, and she still has two high-school-aged children at home. Whitney (Jerman) Blindert, a 31-year-old who farms with her husband near Salem, S.D., works off-farm in the agriculture industry. “I have a lot of respect for women who play integral roles on their family farm—from operating equipment to grain marketing to bringing in off-farm income or taking care of the family and home,” she says. “There is often a woman’s touch behind a successful farm. I also think the number of women farmers is going to grow in the future. New technology creates a level playing field that will help make that happen,” Whitney says. 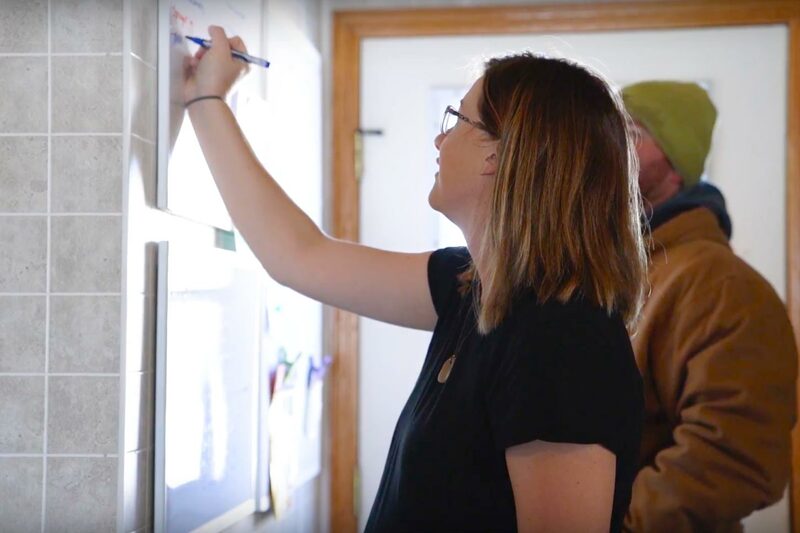 Women are often experienced in juggling responsibilities, especially in South Dakota, which has the nation’s highest percent of working mothers, at 84 percent. Another tip of Wendi’s is making freezer meals during slower times so meals are ready during busier times. Whitney also brings her organizational skills to her family’s operation, managing the calendar and scheduling. Because farm revenue can vary based on weather, market prices and expenses, Whitney’s full-time, off-farm job brings in stable income. As a registered dietitian and licensed nutritionist for the Midwest Dairy Association, Whitney has a demanding job. “I’ve found that carefully planning our off-farm schedule can make a world of difference,” she says. Whitney notices that she and her husband bring different strengths to the operation. “He tends to see big picture and has a lot of ideas, and I tend to think through the different steps required to get that idea accomplished,” she says. “Together, we make a good pair. His education is in agriculture and mine is in nutrition, so we are constantly learning from one another. He loves to teach me about farming and how to be a good steward of the environment. And I make sure he drinks his milk and eats his vegetables,” Whitney adds. Wendi agrees. “Male or female, everybody brings different strengths to the table. Being able to spot those strengths and use them fully benefits the operation,” she says. Whitney is also following her dreams by being part of a farm. “I was lucky to be born and raised in a farm family, and I have so much respect and admiration for my parents,” she says. She also enjoys seeing the results of her work. “When we wean the calves and see how the cattle have grown, I feel a sense of accomplishment,” she says. It can be frustrating for farmers—women and men alike— to see falsehoods about farming accepted as truth. “We do care about our land and our animals and about our way of life,” she says. “Most farmers would be open to providing a tour of their operation and showing you what they do on a daily basis,” Wendi says. Farmers are interested in learning more about non-farmers’ interests and concerns, and they’re eager to build relationships.